I come off as pretty entitled in the first couple panels, but that’s because they’re one sided tl;dr’s of long conversations. Oh well. I spent the last 24 years of my life rejecting everything girly, and then this show comes along. It’s to the point where I did actually buy and meticulously style the hair of a figurine. 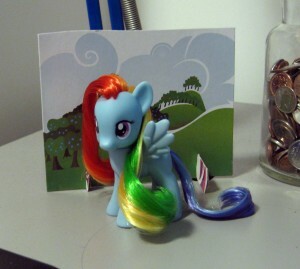 It’s not show accurate, but I’m amused by my flutterdash. I still don’t know how to apply makeup, properly style my own hair, or walk in high heels. If only this show had some out 20 years ago- maybe things could have been different. Ah well. Don’t sweat it. Even the manliest of men can’t help it. Heck, it’s probably the fact that you distanced yourself from “girly” stuff as a kid that helps you like the show in the first place. Also, they’re just too awesome. And adorable. And awesome. This toy is seriously triggering my obsessive side. I put its hair in rollers to get those curls. ROLLERS. At least you can buy stuff to make them look nice without getting weird looks. Us guys get ultra-weird looks buying the things in the first place. Oh man, every time I try to put on makeup I give up. Totaly clueless. Bond night was fun though, we should do something like that again. I got the UFO one with the detachable flying saucer! It terrorized all of my other toys. I for one am not a fan of MLPFIM. I checked it out and while I like the characters I don’t like the show itself. It’s weird, but I’m kinda the opposite. I’m pretty androgynous, but I’m a gay guy, so if you believed in stereotypes, you’d think I’d be into it. But I watched an episode or two and it never really “clicked” with me like a few other “femen-ish” sort of things like Doctor Who or Harvest Moon or Animal Crossing. I don’t have any problem with it or think badly of it or anything, it’s just my “taste” I guess.